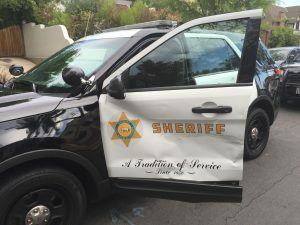 A deputy with the West Hollywood Sheriff’s Station was injured this afternoon when she was hit by a man driving a stolen car. Lt. Edward Ramirez said deputies pulled over a stolen vehicle near Clinton Street and Mansfield Avenue in Los Angeles around 4:22 p.m. The driver stopped for 30 to 40 seconds before fleeing westbound on Clinton with the deputies in pursuit. He turned south on North Orange Drive, where he slowed down as another deputy was stepping out of her vehicle. Ramirez said the man looked at the deputy and accelerated, deliberately hitting her car door. The deputy’s leg was pinned between the door and the ground. The other deputies stopped their chase to assist her. Later the suspect’s car was found on the 100 block of North Sycamore Avenue, and the suspect was found hiding underneath a building there. The driver, Melvin Williams, was arrested and charged with assault with a deadly weapon on a police officer, grand theft auto and felony evading. The wounded deputy suffered bruising and swelling on her left leg and forehead. Ramirez says she is now in good condition. Williams was being held in lieu of $100,000 bail and due to make his initial court appearance Thursday at the airport courthouse on La Cienega Boulevard, according to jail records.